Last month, Marmar, a restaurant in Saudi Arabia, announced that it would begin fining customers who order food and do not finish it. According to the restaurant owner, Fahad Al Anezi, the motivation behind the new policy is to stop food wastage. Al Anezi maintains that many customers will order large quantities of food to show off, a practice he aims to stop at his restaurant. It is He who produceth gardens, with trellises and without, and dates, and tilth with produce of all kinds and olives and pomegranates, similar (in kind) and different (in variety): eat of their fruit in their season, but render the dues that are proper on the day that the harvest is gathered. But waste not by excess: for Allah loveth not the wasters. Food is seen as a gift from God and thus wasting it is seen as a sign of ungratefulness for this gift. Nothing is worse than a person who fills his stomach. It should be enough for the son of Adam to have a few bites to satisfy his hunger. If he wishes more, it should be: one-third for his food, one-third for his liquids, and one-third for his breath. The point of this hadith is clear: people should eat only as much as they need and they often need much less than they think. In addition to verses in the Qur’an and hadith, Muslims are required to fast during the month of Ramadan each year in order to develop a greater awareness of the gift of food and hopefully be less wasteful. In a world where 1/3 of food produced is wasted, Marmar restaurant’s new policy reflects the Islamic attitude towards food and might go a long way toward reminding people not to be wasteful. What do you think of Marmar’s new policy? 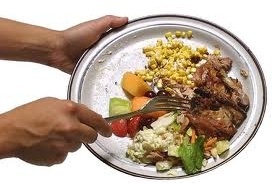 Do you think it is a constructive way of curbing food wastage? Should all restaurants enforce this kind of policy? Please share your comments below. This entry was posted in Food, Middle East and tagged #SSRCWCG, food, Marmar Restaurant, Prophet Muhammad, Quran, waste by Reem. Bookmark the permalink. When a person finishes (food) he should lick his fingers and the food from the plate, for he does not know in what portion of his food the blessing(from Allah) lies. There will definitely be blessings in this restaurant. May Allah bless this restaurant and impose this rule in all the restaurants. Every Restaurant should follow this rule, including INDIA.